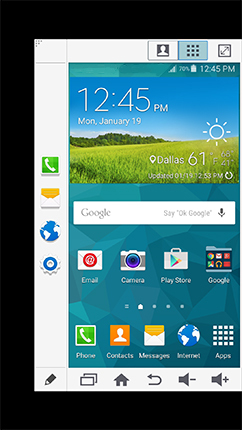 Galaxy S5 (Lollipop): How can I use my Samsung Galaxy S5 with one hand? 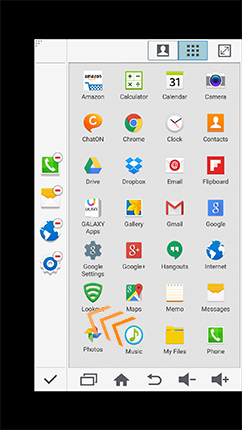 You have access to a feature that makes it more convenient to operate your device with only one hand. 3. Touch One-handed operation . 4. Touch the slider to turn One-handed operation on . 5. Turn on the feature at any time by swiping your thumb from the edge of the screen to the middle and back. 6. The display will reduce to a size where you can reach most features with your thumb. 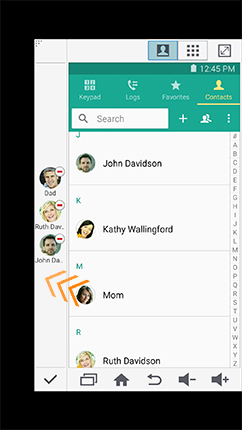 The icons at the top of the screen open a side panel for contacts and applications to which you want quick access (see below for customizing these lists). The icons at the bottom of the screen put the Recent apps, Home, Back, and Volume buttons within easier reach of your thumb. 7. You can resize the screen by touching and dragging in the upper right corner of the window. 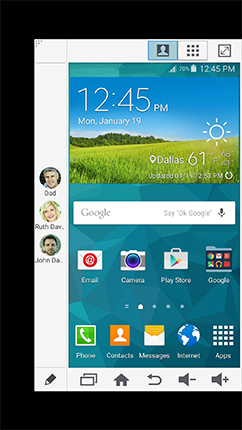 Touch and hold the top bar to move the smaller window around the screen. 8. Touch to return to the full-screen display. Touch one of the icons at the top of the screen to access frequently-used contacts or applications. 1. Touch at the bottom of the sidebar. 2. Touch a contact photo or application icon and drag it to the sidebar to add it. 3. To remove a contact or application, touch next to the one you want to remove. 4. When you are finished making edits, touch to exit the editing screen. 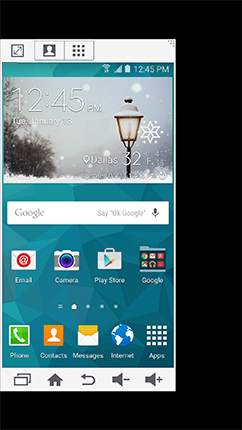 How do I change the lock screen notifications on my Galaxy S5? Change the touchscreen sensitivity so I can use my Galaxy S5 while wearing gloves?